Uncovered throughout the years by scholars in numerous regions in ancient Mesopotamia, the copies of what is believed to be a single manuscript –refered to as the Sumerian King List— details how in the distant past, our planet was ruled by eight mysterious kings for a staggering period of 241,000 years. The list even states that these rulers ‘descended from the heaven’. Experts believe the answer is simple: the list blends prehistorical and ‘mythological dynastic rulers,’ who enjoyed implausible lengthy reigns with more plausibly historical dynasties. In other words, scholars are telling us that some things written in the Sumerian king list are correct, while others –like the implausibly lengthy reigns— just can’t be. The list also details what occurred after the flood, as t clearly states written that ‘another kingship was lowered from heaven,’ and these mystery Kings once again ruled over man. 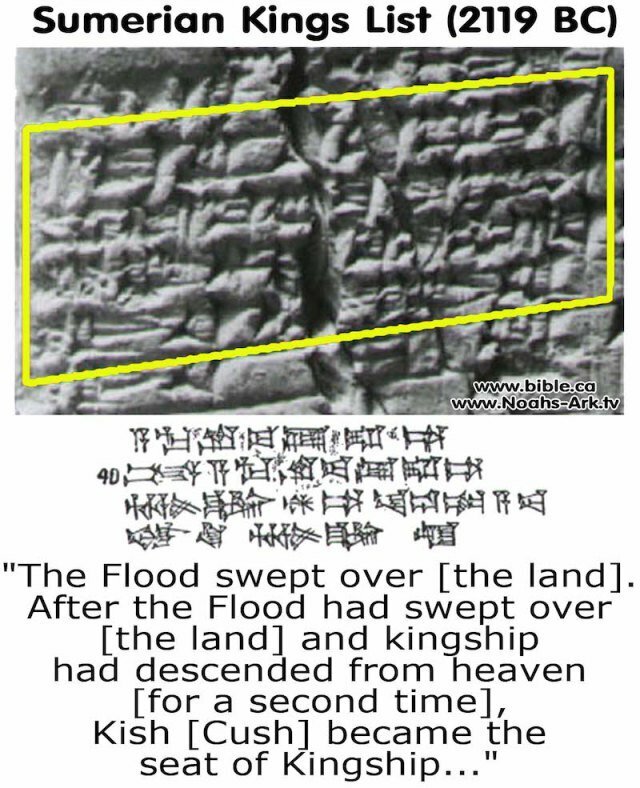 For decades people believed that the story detailed in the Sumerian King List –the incredibly long-lived kings, their demise during the Great Flood, and their replacement from new kings who came from above were simply another set of mythological accounts. However, there are many authors and researchers who disagree, suggesting that which is on the Sumerian King list may not be mythology at all, and point to the fact that scholars today partially recognize some of the kings detailed on the list. The fact that the Sumerian King list mentions eight kings, their names, and lengthy reigns, as well as their origin–kingship was lowered from heaven— has given thought to ‘what if’ that what is written in the Sumerian king list are actual historical references? What if the accounts detailed in the Ancient Sumerian king list are one hundred percent accurate and that unlike mainstream scholars suggest— these impassable lengthy reigns were a possibility, at a time when civilization, society and our planet where much different then today? Do these ancient texts prove Earth was ruled by Ancient Astronauts for 241,000 years? Or — as scholars suggest— is the Sumerian king list a mixture of historical records and mythology? It is noteworthy to mention that the earliest listed ruler whose historicity has been archaeologically verified is Enmebaragesi of Kish, ca. 2600 BC. READ A Painting From The 16th Century Reveals: God Is An Alien!